Take your furry friends everywhere! Are you an avid hunter? If yes, then why don’t you adopt a dog who will be your very best companion when you head out for hunting? We don’t advocate forcing you or someone to be a dog trainer overnight, but hunting dogs are kind of built for this purpose and can give hunters a true advantage. For those who have been thinking that dogs are only meant for protecting a house against intruders or merely a cuddling partner, then you are seriously mistaken. But before you’re planning to take ANY dog for hunting, ensure you train him very well and ideally that they are a hunting dog in the first place, constructed for a particular animal hunt! If you are enthusiastic about hunting, then there are a number of things which you can do. Either you will need to hire a professional trainer who would train your adorable little pup, or else, you will need to train your pup yourself. Have no idea about training your hunting dog? Don’t worry here are some ideas that can enable you to prepare your dog for hunting. And educated you a little about what it might take. Deal with the dog’s weight: If you think that feeding your dog more and more food will make him much healthier and fitter for hunting, then this is a major misconception. Feeding too much food will make your dog obese and he/she will not be able to hunt properly. So, make sure you adjust your dog’s diet thoroughly months before you take it out for hunting. And discount commercial dog food if you would like your dog to be at its finest. A real diet contains a lot of meat and bones in the ideal proportion. Make sure your dog does regularly exercise: If you have been thinking that only humans need to exercise in order to remain healthy, then you are incorrect. Dogs especially need to work out to be able to stay very healthy. Therefore, if you want your dog to be a superb hunter (and to be alert and listen to you), make him perform various exercises on a regular basis so he remains in great shape and can cope with any sort of unfavorable issues during the hunting session. Exercise should be daily off lead dog park visits as well as training exercises for your particular hunting needs Something is living in my attic. 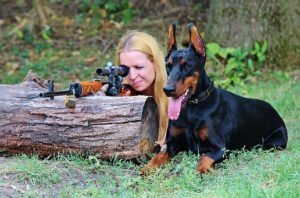 Take your dog to a vet before taking him/her for hunting: There are many people who think that their hunting dogs are born hunters and won’t ever let them down when it comes to hunting. But, this is absolutely wrong. Your puppy might fall under the hunter group, but he/she may not be fit for searching. Therefore, you must first pay a visit to a veterinary doctor and plan about hunting. Also bear in mind that even hunting dogs will need to have the right temperament. Enthusiastic and wanting to get to prey, not too timid, and ones who will listen to recall and the rest of the commands you may teach it. Take care of your dog’s fleas/ticks: because you’re taking your dog for hunting, I am sure you will be taking your doggy into a forest or any area where there is loads of plants, trees and shrubs. And where there are trees and plants, there needs to be ticks and fleas. So, make sure you take your pet to the vet and he prescribes oral or physical medicines so that ticks and fleas do not feed your dog. And also ask the doctor to confirm your veterinarian and ask them to check if there are any /fleas left or not. Did you know that may tick and flea medications are preventers or just ward off adults but a few don’t affect the eggs or vice versa. Sometimes flea bathes need to be used in conjunction with monthly pill remedies. These were some of the tips that can allow you to prepare your pooch for hunting. Thus, follow these suggestions and accordingly prepare you hunting or water dog.